These Giant Meal Worms are typically used as a food source for reptile, fish, and avian pets. They are also provided to wild birds in bird feeders, particularly during the nesting season, when birds are raising their young and appreciate a ready food supply. 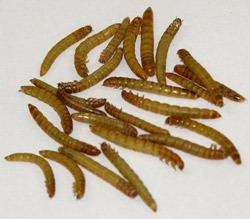 Mealworms are high in protein, which makes them especially useful as a food source. They are also commonly used for fishing bait. 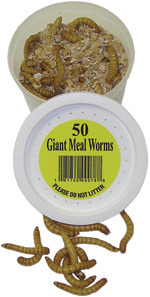 50 Giant Meal Worms packed in a plastic container. 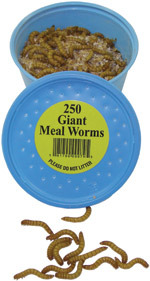 250 Giant Meal Worms packed in a plastic container.